Hey adventurer! Are you hungry after your long journeys through Azeroth? Well, I’ve cooked up a dish for you that’s straight from the wonderful nation of Pandaria. This special recipe was created by the amazing Sha of Happiness. She has picked some of the most delicious dishes in all of Azeroth and re-created them in her kitchen. I’m sure you’re hungry, so let’s get started on this very simple, but very delicious dish! 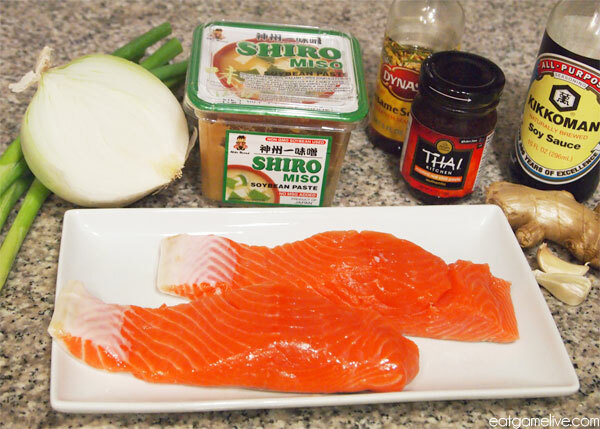 Recipe adapted from Fire Spirit Salmon by Sha of Happiness. Prep time for this dish is roughly 15 minutes. Total cook time is about 10 minutes. This will make 2 servings. I’ve made a slight deviation from Sha’s original recipe. In her recipe, she suggests cooking the salmon via pan or roasting it in the oven. I’ll be roasting it in the oven, but I made a minor change — I’m cooking it en papillote! So, I’m sure you’re asking… What is en papillote? The term “en papillote” is French for “in parchment”. Basically, the method is you take some sort of food, wrap it into a little package and then cook it. Since the food is wrapped up in its own little container, it will basically be steamed by its own juices (or what ever liquid you’ve put in the pouch). There are many regional variants on this type of cooking. Zongzi, which is a Chinese dish comprised of sticky rice and various fillings, uses this technique but with leaves. Zongzi is also insanely delicious, so if you ever have a chance to get one, I recommend it! Set a pan on high-heat. Add in your olive oil. Sautee your garlic and onions. 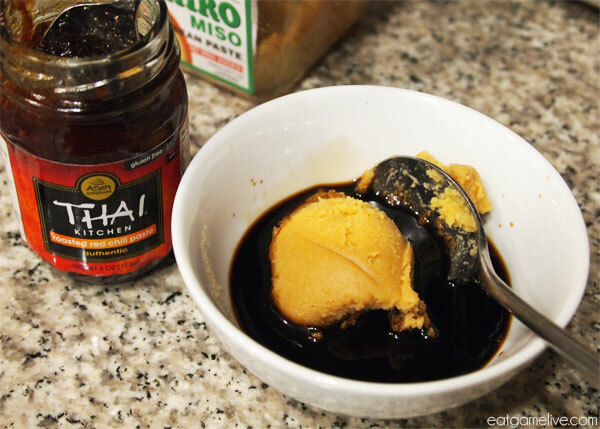 In a bowl, combine your soy sauce, sesame sauce, and red chili paste. Add in your sliced ginger. 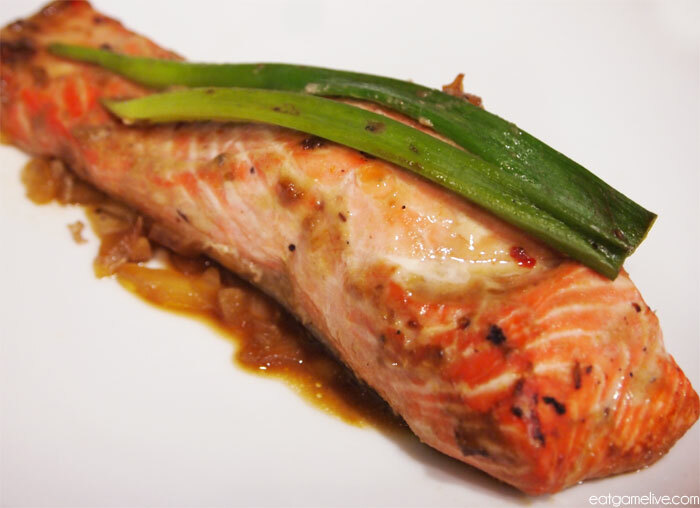 When the salmon has finished cooking, you will want to remove these slices before plating. 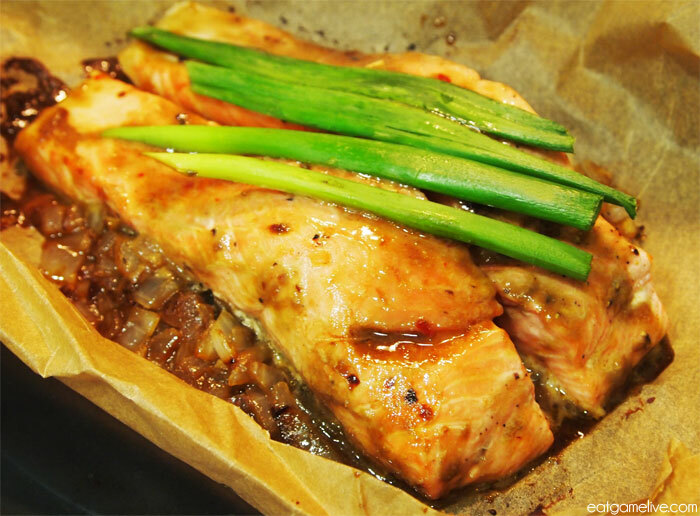 Set aside and prepare your salmon! Pre-heat your oven to 375° (~190° C). Place your sauteed onions and garlic on one side of the parchment paper. 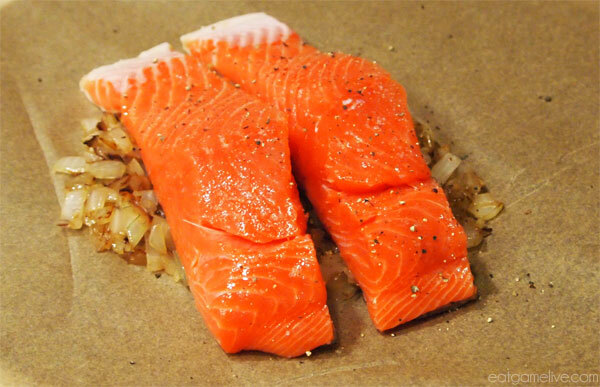 Place your salmon on top of the onions and garlic. Season your salmon with salt and pepper. 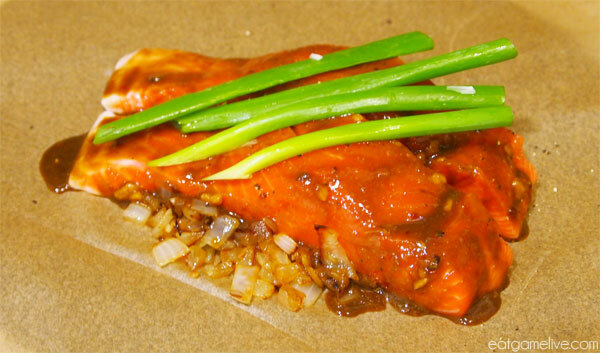 Fold the parchment paper over the salmon, making sure to leave air inside the package. 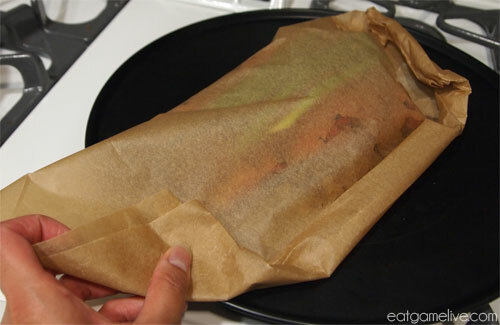 Roll the sides of the parchment paper up, so that the package is sealed. Place in the oven and roast for about 7 minutes. Remove from the oven when done. Be careful when opening the package! This entry was posted in guest recipe, seafood, world of warcraft and tagged blizzard, gaming, miso, mists of panderia, salmon, world of warcraft by admin. Bookmark the permalink. Are you going to update soon? I miss your recipes! Sorry for the hiatus — lots of changes in my life, and I thought I needed a break. Thanks for checking in!